large mat&big red spatula&yellow sponge and discount price little inventory by DDM by DDM at Turuya 7. MPN: unknown. Hurry! Limited time offer. Offer valid only while supplies last. Claims & Features 1.Most important is 3 product in one. 2.Material %100 grade silicone. 3.Non stick easy to clean,quick dry& dishwasher safe. 1.Most important is 3 product in one. 3.Non stick easy to clean,quick dry& dishwasher safe. EASY TO CLEAN &DRIES FAST-Taller,wider spaced ridges allow for maximum ventilation, to dry your dishes faster than traditional dish mats. Easy to put finger into the ridges to clean the mat, excess water or spills wipe away easily. ANTIBACTERIAL - 100% FDA Approved.We use Food-Safe Silicone which prevents growth of mold, bacteria and germs providing your families with safe, clean and dry dishes. Our mats are far better than microfibre mates which are prone to developing bacteria. FDA LFGB approved. 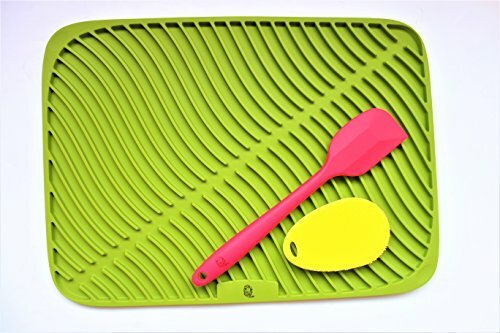 LARGE SIZE DISH DRYING MAT -HEAT RESISTANT-Measuring 12.5" x 17" x 0.4", 1.3 Pound weight make the Dish Drying Mat is the thickest dish mat.450° %100 food-grade silicone material,environmetal,harmless,soft,withstand oil contamination.Uneasy to be fading,easy for cleaning,durable lifetime.Working temperature range: -40°C~+230°C Wash it with clean water and disinfect it with boiling water before using, wash it and put it in a clean and dry place after using. Keep it away from direct sunlight. If you have any questions about this product by DDM, contact us by completing and submitting the form below. If you are looking for a specif part number, please include it with your message.